As my Miss 10 stated, highly likable because hit features the beach and dogs. So if these tick your little ones boxes, then this is a keeper. Personally I loved the surfing granny concept and the gentle persuasive touch these women have on our hesitant main character. Fears and the awesomeness of the ocean are examined and overcome with Wolfer's enjoyable prose but it's Blair's sublime illustrations swelling with texture and life that really pulled me. Highly recommended. 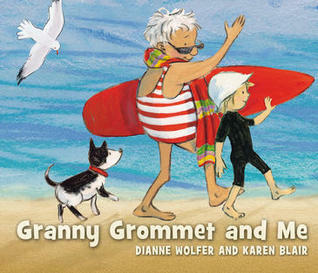 A lovely story of a child overcoming nervousness of the Sea with his surfy Grandma and her friends. A delightful story about a boy spending the day at the beach with his surfing grandmother and her friends. But will he ever be able to put his feet in the water?